FIRST. “Was there divine intervention in that goal? 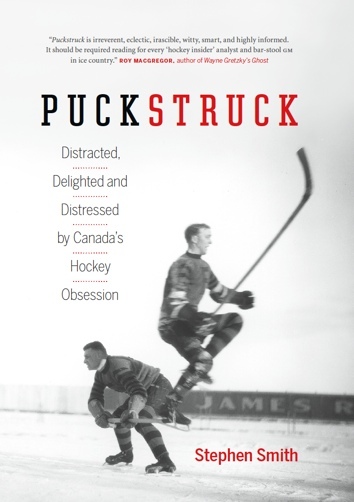 I don’t know if there was divine intervention or not but I know that Paul certainly intervened, for whatever reason.” Alan Eagleson ponders the eternal questions, sort of, as he recalls Paul Henderson’s famous 1972 goal in Jim Prime’s How Hockey Explains Canada (Triumph). SECOND. If they build him, will it come? Quebec City is still trying to nail down details of a new 18,000-seat, $400-million rink that it hopes just maybe might be the thing to lure an NHL franchise back to town. The soonest it could be open for skaters would be oh, maybe 2015 or so? That won’t stop the city from raising statues on the site more immediately. Jean Béliveau is a good bet to get one, but first up will be Joe Malone (pictured here), the city says. Centenary celebrations for the two Stanley Cups his Quebec Bulldogs won in 1912 and ’13 are coming up, reasons as good as any to put him on a plinth. The Phantom, they called him, which is pretty good. Playing on a Montreal Canadiens line with Newsy Lalonde and Didier Pitre, he scored 44 goals in 20 games in 1917-18. He still holds the NHL record for most goals in a game, the seven that he scored for Quebec against Toronto in 1920. THIRD. “I couldn’t believe how many guys were into cigarettes when I joined the Blackhawks. Ashtrays in the dressing room! Stan used to puff away pretty good, even between periods.” Tony Esposito recalls the smoky past in Forever A Blackhawk (Triumph), by Stan Mikita and Bob Verdi.